Mason (Ellar Coltrane) is a boy. He lives with his sister (Lorelei Linklater) and single mother (Patricia Arquette). His absentee father (Ethan Hawke) re-enters his life. He grows up and has unique experiences (albeit comparable to ones that many boys often do). . We see him grow up over the course of twelve years until he starts college, which is ostensibly the point at which he stops being a boy. Of course, that’s a rather simplistic take on the film’s plot, but it’s also essentially how it goes. In case you’re unaware, the twelve witnessed years of Mason’s life are not the kind usually seen in movies. We literally see Mason go through adolescence. This wasn’t accomplished by having different actors play the same characters or “Benjamin Buttoning” him. They actually accomplish this through an incredibly elegant, unusual and strangely obvious method: Mason and the other characters who are constant presences in his life are played by the same actors, with scenes being shot a few days every year for all twelve years (it was quite a pleasure identifying the year the movie was in based on the music in the back/foreground… ranging from Britney Spears to Lady Gaga to the Black Keys). This concept is a truly astonishing one. Linklater incorporated events from all of the actors’ lives into the script and wrote it as the movie was being produced. That’s how he managed to track and “document” Mason’s life. Maintaining the continuity with actors and story over the course of those twelve years is just a stunning accomplishment and I’m in awe of it every time I stop to think about it. We’re afforded this rare opportunity to witness a stranger truly grow up in front of our eye; as Ethan Hawke puts it, it was like watching “timelapse photography of a human being”. This has to be the single greatest feat that Boyhood manages to pull off, separating it from the myriad other “coming-of-age” dramas that have filled the cinematic landscape. I’m naturally concerned about films that place high demands on child actors since I find their acting efforts very often inconsistent. For the most part, Coltrane was inoffensive and got better as he matured but some of the supporting young actors were far more questionable, with Lorelei Linklater sticking out among them. Arquette was warm but convincingly flawed as the earnest mother struggling to juggle her family, career and love life (she certainly has a type). As for Hawke… well, the constant thought I had as I witnessed his character try to work his way back into a meaningful place in his children’s lives was that if I were to ever have a deadbeat dad, I’d want it to be him. All that being said, I unfortunately can’t say that I connected to the film as much as I had hoped. In fact, it took me a surprisingly long while to be drawn into the story. The biggest issue for me was that I failed to see a true narrative in the film. It felt like more of a documentary to me than most of the documentaries I see because even most documentaries manage to cull a more involving story from the countless hours of footage they shoot. I don’t think that was even necessarily a flaw with the film, but when I have trouble seeing goals and intention in a story, I tend to have problems connecting. That’s not a criticism of the writing or filmmaking… it’s more a comment on myself as a consumer of stories. It’s hard to balance the personal pleasure experienced watching a movie and the appreciation for the obvious artistry and skill demonstrated in making that movie when forming opinions and impressions. 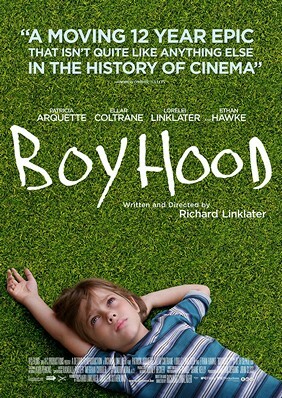 I know that Boyhood is an impressive work and I can see why it’s so widely adored but it simply wasn’t something that registered quite so deeply with me. All that being said, I still can’t help but strongly recommend the film… it’s absolutely worth two and a half hours of your life to see a boy become a man.